Get to know your neighborhood a little better. Get fit. Get back to nature without having to pack up and leave town. Whatever your summer goals are, below are a few urban hikes that will ease your way into the great outdoors and help you stay active. While some of them are more walks on paved sidewalks than treks on dirt trails, all of them are highly enjoyable (and it’s okay to take it easy when you’re just starting out). 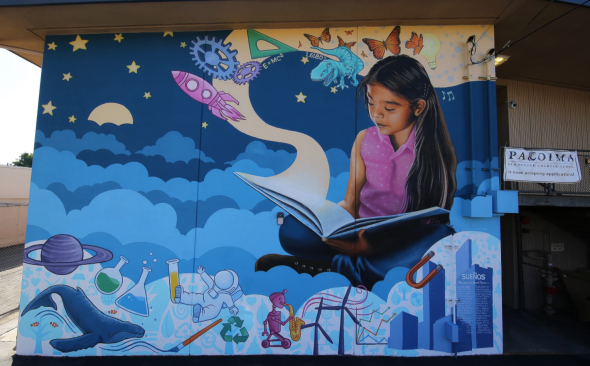 Pacoima native Levi Ponce led the movement to turn blank walls along Van Nuys Boulevard into colorful canvases in an effort to beautify the area. Start at the intersection of Van Nuys Boulevard and Herrick Avenue at the mural depicting Tongva medicine woman Toypurina. Walk until you reach Ponce’s Lady of the Valley, about two miles southwest near Arleta Avenue. Along the way, you’ll be able to enjoy 20+ murals! Griffith Observatory. Photo: Steve Hymon. 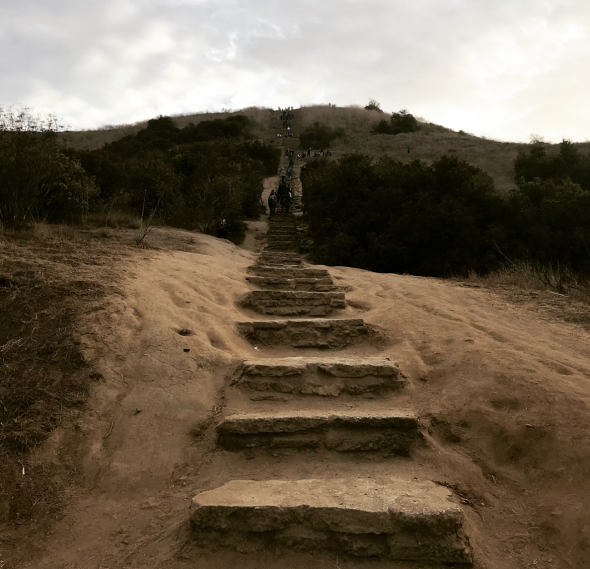 Griffith Park is the largest municipal park with urban wilderness in America, and there are plenty of hiking trails in the park worth exploring. 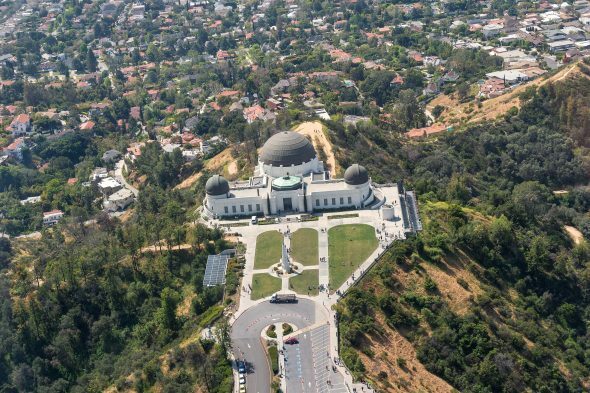 An easy one to start with is the East Griffith Observatory Trail. Take the Red Line to Vermont/Sunset Station, then connect with the DASH Observatory shuttle to the Greek Theatre. Walk west on Vista de Valle. The trail begins past the shaded picnic table. At the end of the trail you’ll be at the Griffith Observatory. You can then catch the shuttle back down if you’re too tired to walk, or continue on to another trail! Photo by katyaryn via Instagram. This hike goes through a rehabilitated prairie to an overlook with sweeping views of the L.A. Basin. Though short, the trail is basically one long staircase which makes for a great workout. Take Culver City Bus 4 to Jefferson/Holdrege — the stop is a 5-minute walk from the trailhead — or walk from the Expo Line La Cienega/Jefferson Station. The walk from La Cienega/Jefferson Station is approximately one mile southwest on Jefferson Boulevard. On weekends, The Link – Baldwin Hills Parklands shuttle is available from La Cienega/Jefferson Station to the overlook. Photo by ruffcutzdtla via Instagram. 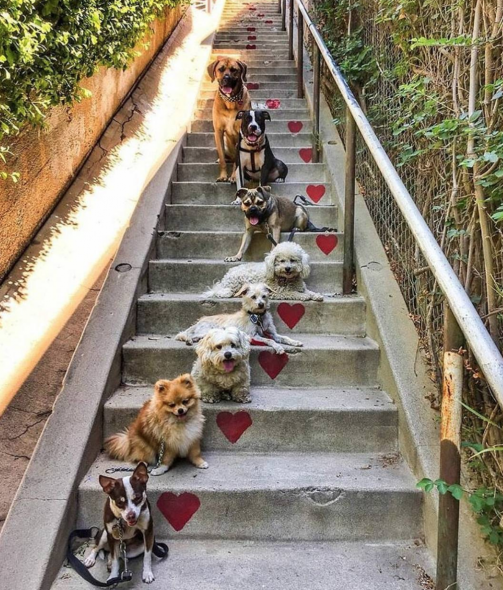 This walk is built around the only officially designated stairs in Silver Lake — the famous location where Laurel and Hardy made their 1932 Academy Award-winning short film The Music Box. Begin your walk near the corner of Sunset Boulevard and Parkman Avenue. You’ll be making a loop up and down all the “secret stairs” in the area. Check this self-guided walk tour for detailed directions, or see map on right (click to enlarge). 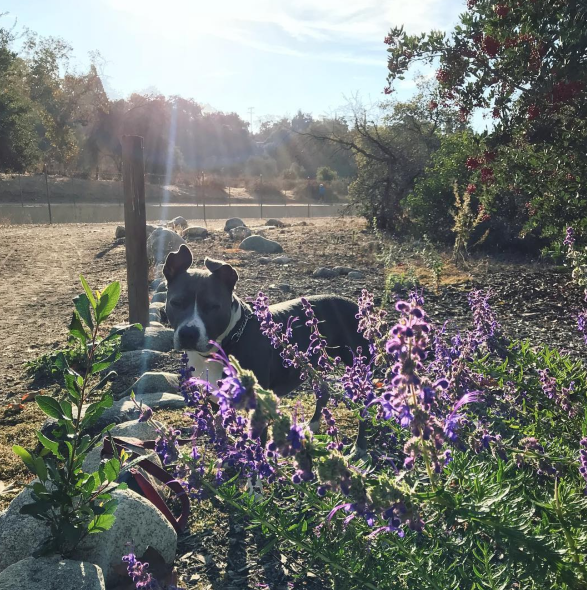 Enjoying some sunshine in the Lower Arroyo Seco. Photo: Anna Chen. Take a leisurely walk from South Pasadena upstream along the Arroyo Seco to the Rose Bowl. Start at South Pasadena Station and walk approximately one mile west on Mission towards the Arroyo Seco Racquet Club, or take Metro Bus 176 to Pasadena/Mission. From there, head north toward the San Pascual Stables and enter the Arroyo Seco Trail, which follows the Arroyo Seco flood control channel at the bottom of a canyon. Approximately 1.5 miles north you’ll be in the Lower Arroyo Park, where the casting pond and field archery range are located. 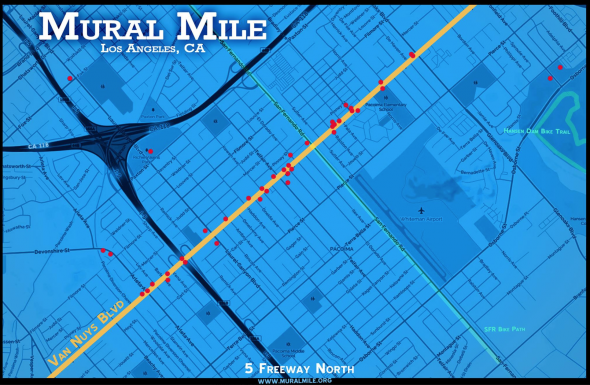 Continue north on the trail, pass under the Colorado Street Bridge and shortly afterward, the 210 freeway bridge. The trail rises up a very short hill and ends at Arroyo Boulevard. 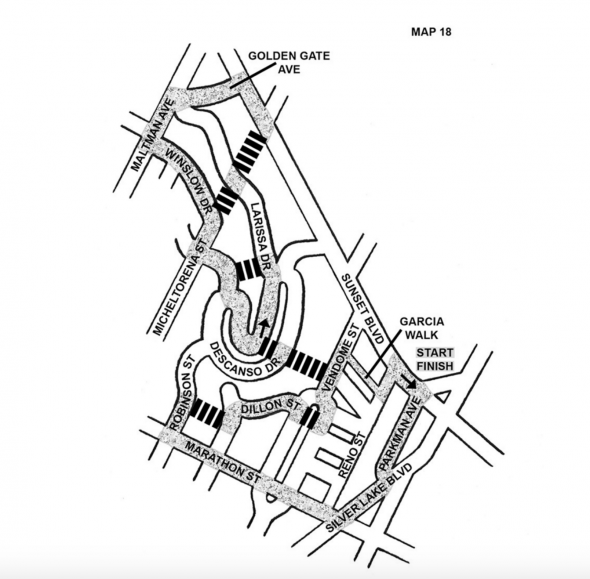 Follow that north to Seco Street, where you can pick up the 3.3-mile pedestrian/running path that circles the Rose Bowl and adjacent Brookside Golf Course. On a clear day you’ll be able to see well beyond DTLA to the Palos Verdes Peninsula and beyond to Catalina Island. It’s also good for rail history buffs — the trail leads to remains of the Mt. Lowe Railway and one of the alpine resorts it served. To get there, take Pasadena Transit Route 88, a weekend bus service that runs between the Gold Line’s Memorial Park Station and the trailhead. Another option is to take the Gold Line to Lake Station, then call a Lyft or Uber to the trailhead. That ride is about $9 each way; split with friends to reduce the cost. For weekday bus access, take Metro Bus 180/181 to Altadena/Lake and then walk about one mile north on Lake Avenue to the trailhead. Please note: you’ll be walking in the parking lane much of the way but from personal experience, it’s not bad. At the corner of East Loma Alta and Lake, walk through the stone and metal gate on the east side of Lake. Walk up the paved driveway a short way and when it makes a hard left, go straight and pick up the dirt hiking path that descends into a wash and climbs back up. It’s about 1.6 miles to the top of Echo Mountain with about 1,400 feet of elevation gain. If you’re feeling “inspired” you can continue on towards Inspiration Point, just make sure you have plenty of water and a jacket because it can get chilly up there! With regards to Pasadena Transit’s Route 88: Some of the natives up in Altadena are not pleased with the great unwashed hordes flooding into their quaint village. At 4,310 acres, Griffith park is definitely one of the larger municipal parks of any type. In California it’s second only to San Diego’s Mission Trails Regional Park, which is 5,800 acres, and almost all wilderness.